*Donation of new bedding or PJ's for foster kids and youth are accepted. 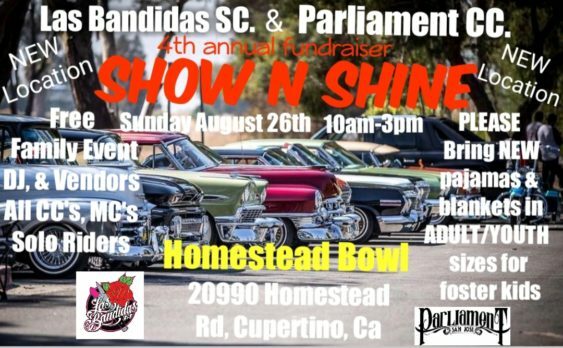 Las Bandidas & Parliament CC are at it again this year for the 4th Annual Fundraiser Show N Shine Car Show on Sunday, August 26, 2018. This is a family event, where you can expect for food, DJ, and vendors. Las Bandidas will also be collecting new child/adult size pajamas & blankets to be donated to foster kids. Same good time, same cause. So come out, donate, and bring your rides to show ‘n shine for a good cause.